In your comments when you vote for Irene's proposal, strive to explain how well our community meets their racial, ethnic, socio-economic status, urban/rural diversity goals, as well as us being very much an under-researched group. There are 10 health provider organizations across the country that are involved in this, and are funded to take part in it...They then reach out to their participants and invite them to join up. 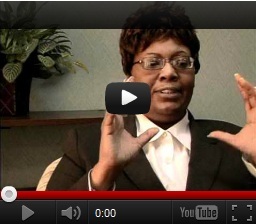 Very careful consent process is involved in that." We also want to make this available to anybody in the United States, so there will be a direct volunteer opportunity for people to sign up...We want to enroll many people who have not traditionally been part of medical research. In fact, we'd like more than half of the one million participants to be that part of under-represented group, which is pretty bold... (these are) racial and ethnic minorities, socio-economic status, people who might not necessarily have been engaged in research, rural participants who often times don't get touched by medical research opportunities. All of that together, (we want to) look at those various groups because we want lots of those folks because we want to understand health disparities as well. We've already enrolled a few thousand people...there's a biobank at the Mayo Clinic that's prepared to take 32 million samples and store them in a carefully barcoded way... There's a database plan and a security system as best as the world can provide because we want to be sure that this kind of this kind of system is not subject to hacking...But we want to launch when it's ready and right, and we don't want to rush if there are any concerns that the Beta Test is telling us that we have some work to do. 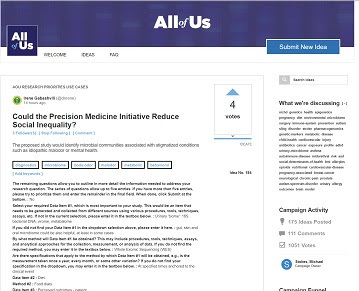 Please let the 'All of Us' team know that you would like the proposal to research our community, submitted by the MEBO Scientific Director, Irene Gabashvili, PhD, will be included in the 'All of Us' Research Program. If Irene's proposal of our community to participate is accepted, as Francis Collins states, "it's a program that's going to be going on for many years." We need to have a research program that will be funded beyond the initial phase - something that has proven to be impossible for our scientists until now! Please vote and give comments to 'All of Us' in Irene's proposal. You can do this anonymously after you register in the site. In your comments when you vote for Irene's proposal, strive to explain how well our community meets their racial, ethnic, socio-economic status, urban/rural diversity goals, as well as us being very much an under-researched group. 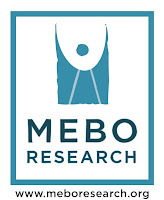 Your privacy is of the utmost concern for MEBO and for All of Us! Click the icon below to do so. Thank you!